I just love making Valentine's Day cookies! I mean, it's all about love, hearts, the color red, and sweethearts! I have a lot of sweethearts...my husband, my kids, my grandkids...that's 16 1/2 (grandchild on the way:)) sweethearts right there! 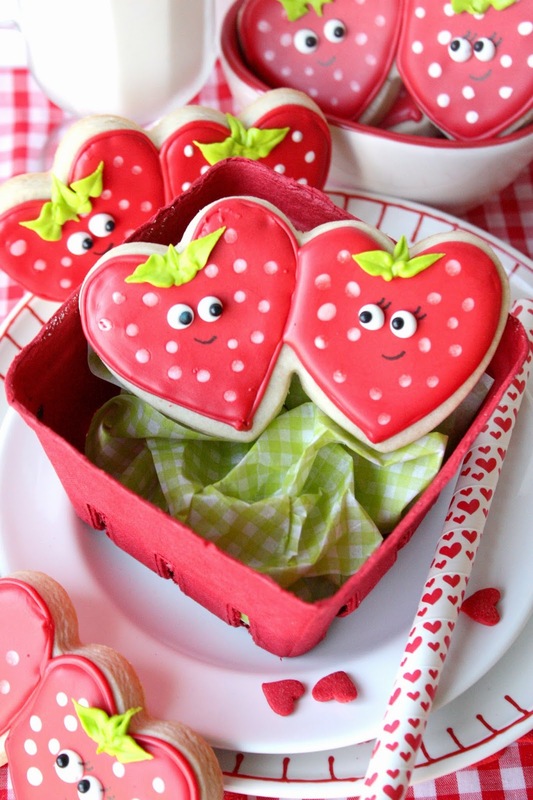 So...staring at my double heart cookie cutter and brainstorming for something other than just regular hearts, I came up with another red heart, from nature...strawberries! I'm sure you've noticed that strawberries are heart shaped, right? It may not be crazy creative, but I was excited to make these cute couples. And of course, these strawberries don't have to be a romantic pair, but can be pals, or grandma and grandchild, or...you get the picture. I'm pretty smitten with how these turned out! You know me...simple and cute is my cookie mantra, and these are both. 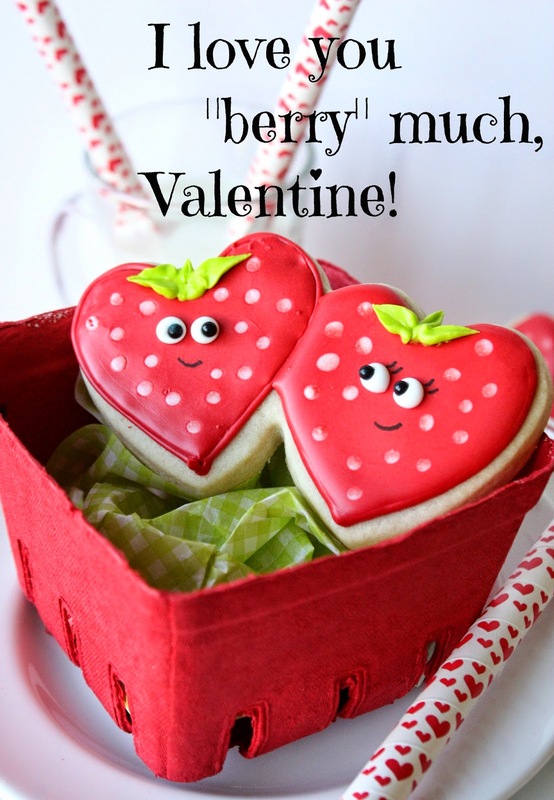 I hope all my sweethearts know how "berry" much I love them when I give them these cookies for Valentine's Day. 1. Roll cookie dough out about 3/8-inch thick. 2. Cut out cookies from dough and transfer to cookie sheet with spatula. 3. Place baking sheet in freezer for about 10 minutes to help cookies hold their shape. 6. With the red marker, outline the hearts. 7. With the red tinted, medium consistency royal icing, outline one of the hearts on the cookies, and let it set for about 10 minutes. 8. Outline the other heart with the red royal icing. 9. Fill a decorating bag fitted with a #1 tip with some untinted (white) royal icing, with the same consistency as the red. Set aside. 10. ill the hearts with the red royal icing and a #3 tip. Use a toothpick or other touch-up tool, to fill the icing to the edges. 11. Immediately add small dots to each heart with the set-aside bag of white icing. 12. Allow cookies to dry for a few hours, or overnight. 13. With the green icing (on the thick side) and a leaf tip, add the leaves. 14. Add small "globs" of white royal icing for the eyes with a #1 tip. 15. With tweezers (used for food), add the black sugar pearls(try to position them so that the strawberries seem to be looking at each other). 16. Use the black marker and add the smiles. So berry cute..i had to say it! I think these are very creative! My Mom's birthday is on the 13th, so we have always used the Valentine theme. These little cuties would be perfect. GAAAAHHHHH!!! why do your cookies always make me squeal Sue?!? and if you don't think these are crazy creative well i say keep 'em comin'! :>D i berry much love these! Go adorable and I know someone who would just go crazy over these! Everything you do is so amazingly cute! Oh my goodness! I love these!! You always have the best cookies with the most cleaver ideas! Pinning now! These look so amazingly beautiful! No Michelle, That number counts my husband, three kids (and spouses) and the ten (almost) grandchildren! :) I don't think I will ever make it to 16 grandchildren. :) Thanks for your sweet comment! 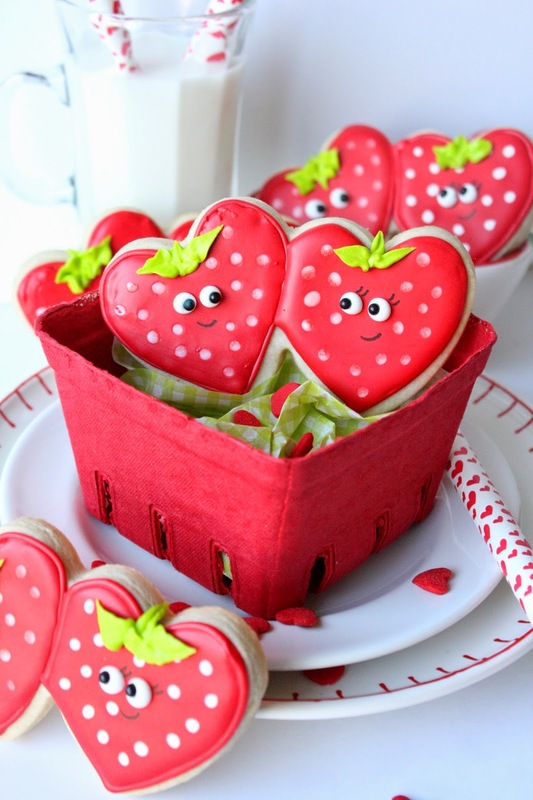 Those cookies are berry adorable! I love that made strawberries with faces ... makes me smile! I have my cookie cutters out ready to use but made chocolates and cupcakes instead! Hope I get around to it! These are adorable! I just want to take a bite out of one of them!! Chocolates and cupcakes sound yummy! These are so cute and fun. Perfect for anyone for Valentine's Day. What a creative way to use your heart cookie cutter Sue. Your cookies are always so adorable! 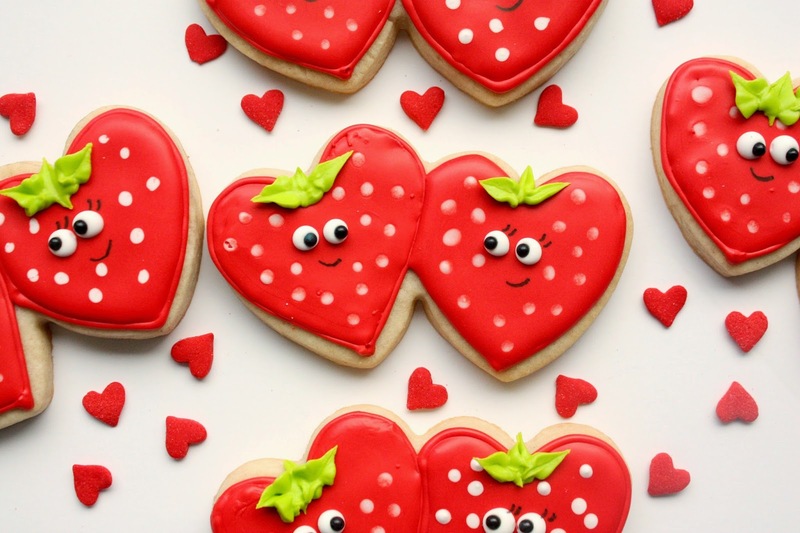 Your family is going to love eating these special Valentine's cookies. Thanks, Rachel! Have a Happy Valentine's Day with your family! Wow....talk about adorable Sue! Your creativity never ceases to amaze me! And Wow....16 1/2 grandchildren, that's amazing!